Being & Tim: Nothing to lose but their....? 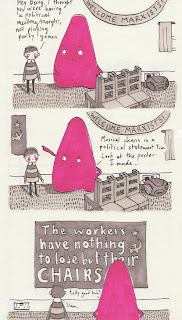 This cartoon refers to the famous lines from The Communist Manifesto: 'the workers have nothing to lose but their chains. they have a world to win. workers of the world unite!' The idea that Marx might have been referring to a giant game of musical chairs seemed too humourous to resist, although I am beginning to realise how the humour of my comics is perhaps not quite so sophisticated as I once thought....!!! You can read about the Communist Manifesto here, or better still read it in full here (it's not very long). That second site (www.Marxists.org) is a wonderful site with loads of texts by a range of different socialist and marxist theorists. Which reminds me, stay tuned for the next Being & Tim featuring Alvin, Simon and Theodor Adorno as the Chipmunks....!